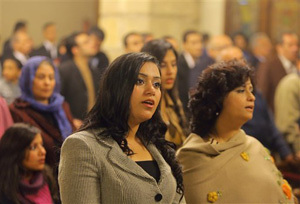 Worshippers attend Orthodox Christmas Eve Mass, where an Oct. 2013 deadly drive-by-shooting killed several at a wedding party, in the Warraq neighborhood of Cairo, Egypt late Monday, Jan. 6, 2014. 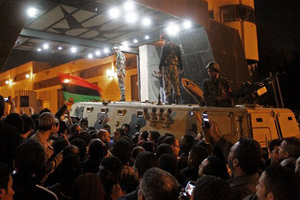 Photo Credit: The Associated Press, Aly Hazzaa, El Shorouk Newspaper, EGYPT OUT, File. The amended constitution Egyptians will vote on later this month in a nationwide referendum enshrines equality between all Egyptians and instructs the next parliament to legislate a new law that will facilitate the construction and maintenance of churches. It also removes language in the 2012 constitution that critics feared could pave the way to the creation of a purist Islamic state, something that gravely alarmed Christians. Associated Press reporter Mamdouh Thabet contributed to this report from Assiut, Egypt.